After a year of successfully growing out my hair and achieving the quickest amount of growth I had in years, I faced a serious set back. Deep conditioning treatments, protective styles, and moisturizing around the clock resulted in popping curls, but all of that was destroyed after an unfortunate meeting with an extremely hot flat iron. Leaving the salon, I should have known something was wrong. Although my hair was super straight, it was also SO straight it felt thin. Since I have an extremely fine texture it does not take much heat to get the job done. But the stylist had previously straightened my hair before, so I thought no big deal. After shampoo and deep conditioning one week later, I discovered not only did I have heat damage on a section of my hair, the damage started at the root and traveled all the way down to my ends. Completely and utterly in shock, I quickly started to think of my options. Do the big chop? No. Get a tapered cut? No. Maybe shave a side of my head like Cassie? No. No. No! I decided to roll up my sleeves and grow out my heat damage for the rest of the year. Looking at the glass half-full, growing out my heat damage would allow me to do a few things. The damage started at the root and traveled all the way down to my ends. First, this allowed me to test new products for performance as it pertains to damage recovery. Heat damage occurs when the keratin bonds within the hair are broken, resulting in a permanent physical change of your hair structure. Heat damage at this level is irreversible, but there are products that can help to strengthen the hair after damage. My goal during my time of growing out my heat damaged hair was to make sure the newly growing naturally curly hair was healthy and without breakage. Products like Ouidad Curl Recovery Melt Down Mask Extreme Repair Mask helped to promote the health of my hair and prevent future breakage. The product is also said to help repair elasticity, which was really needed on other areas of my hair didn’t have as much damage but still needed some TLC. This product definitely got the job done, although on the pricey side. Not sure what elasticity means? Click here to find out more. Secondly and most important, I wanted to connect with readers. 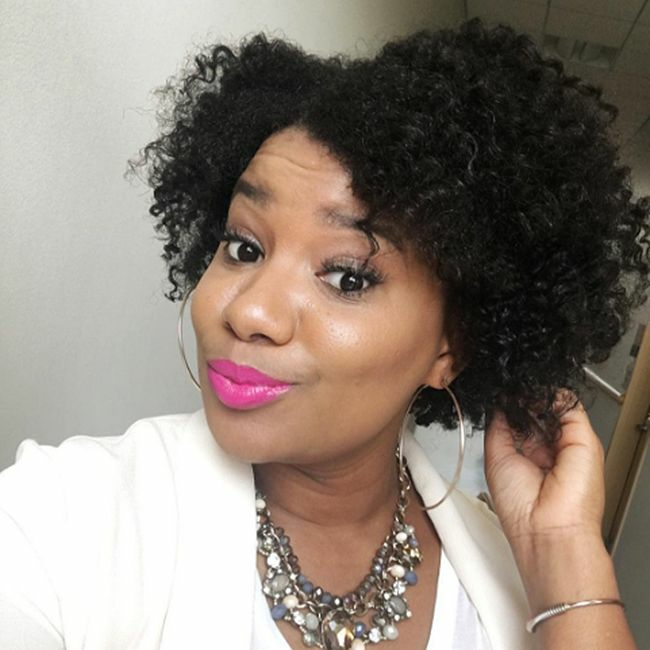 As a blogger, readers look to us to be authentic and provide real-life solutions that they are unaware of for hair care. Not every woman has a dedicated stylist nor can some women afford one, so blogs serve as their primary source for natural hair education. One of the things I’ve heard since becoming a blogger is “that blogger’s hair is always perfect, I can’t relate to her.” Since I use my platform to educate, I figured what better way than to experience a situation a lot of other naturals go through as a way to properly inform others from first hand experience. Although I decided to grow out my heat damage for nine months, this January I finally cut the remaining straight pieces off and embarked on a full year No Heat Challenge. Since then my hair has been flourishing and growing back faster than ever. Whether you decide to big chop after heat damage or grow it out gradually like me, there is no right or wrong strategy. Do what you want, fits your lifestyle, and works best for your hair. Have you experienced heat damage? How did you deal with this?